Tawteen, the recently launched localisation for services and industries in Qatar’s energy sector, has officially opened its service centre which serves investors interested in joining the programme. The country’s GDP is expected to increase by 1.6% from Qatar Petroleum’s (QP) localisation programme ‘Tawteen’, which was launched Monday by HE the Prime Minister and Interior Minister Sheikh Abdullah bin Nasser bin Khalifa al-Thani. 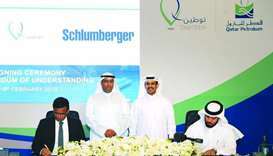 Qatar Petroleum and Schlumberger signed a memorandum of understanding (MoU) for collaboration in working towards the objectives of Tawteen to enhance localisation in the energy sector. Qatar Petroleum (QP) signed three agreements worth QR9bn ($2.47bn) with leading international companies on Monday as part of QP’s ‘Tawteen’ initiative that aims to localise the energy sector’s supply chain and expand the country’s small and medium-sized enterprise (SME) base.